Your living room provides relaxation, entertainment and home comfort. But occasionally, you cannot help but wonder: why does this kind of luxury have to remain restricted indoors? If only you could read, dine, watch TV and enjoy all of your favorite indoor activities beyond your home’s walls. Luckily, times are changing, and the new trend is bringing the inside of your home to the glorious outdoors! With an outdoor living room crafted by Topaz Design, you can enjoy the best of both worlds. In order to transform your outdoor dream into a reality, you need a team that knows how to master every piece of the puzzle. At Topaz Design Group, our experts coordinate every phase and detail to make sure that you are completely satisfied with your new outdoor space. With our trained expertise, our team strategizes every aspect of your outdoor living room to ensure that your chosen materials are installed harmoniously and beautifully. Tactically blending individual hardscape and softscape elements together, our team has emerged as the trusted designers that will uniquely arrange every outdoor feature to orchestrate your stunning, original outdoor paradise. As part of our services, we can also enhance your yard with low-voltage accent lighting, privacy screening, walkways, and irrigation systems. No matter how you want to upgrade your backyard, our landscape designers will seamlessly arrange your outdoor living room in a way that will provide the most relaxation, enjoyment and amusement for you and your loved ones. In addition to delivering outstanding service, Topaz makes the design and build process go smoothly and efficiently. As a full-service landscape and hardscape contractor, our team handles every aspect of your outdoor living room. 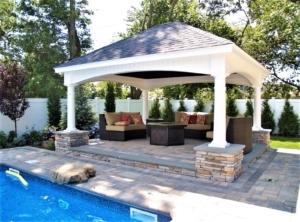 With our full-circle approach, your outdoor sanctuary will move through each stage with ease. Here at Topaz Design, our team can create the outdoor living room of your dreams. Going one step further, with our alternative financing options, we work with you to bring your vision to life under an affordable payment plan. To get in touch with Topaz Design Group regarding outdoor living rooms, complete our online form today.